Are you newer to FBC and would you like to know more about this church? The Pastors? FBC’s various ministries? Then, come to Pizza with the Pastors. This Sunday luncheon is designed to help you become more familiar with FBC and for us to learn more about you. Who’s this for? ~ Any person or family new to FBC and wanting to learn more. How much does it cost? ~ It’s completely free. What do I need to bring? 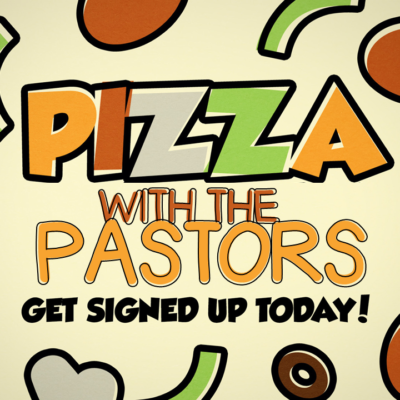 ~ An appetite for salad and pizza, your questions about FBC, and a desire to get to know the pastors, their families, and other new people to FBC. Help us prepare. Click here to REGISTER so we know how many to expect.